CLIO lives alone in the desert with the ghost of her dead husband, BRYAN, and the child they never had. She spends her days collecting stones and animal bones, and building a monument, her personal cathedral. Her isolated, almost feral existence is interrupted by the arrival of ALEX. Alex is a war journalist and was a colleague and close friend of Bryan’s. We learn that Bryan was killed in Syria, beheaded by ISIS, after traveling there at Alex’s behest. Alex has come to Clio’s home with an agenda: he wants the rights to Bryan’s last work to use in a film he is making. Clio’s reaction to the horror of Bryan’s death has been to retreat from the world. She thinks that the only sane reaction to an insane world is to choose not to partake in it. Alex’s grief and guilt has left him convinced that the only reaction to suffering in the world is to try to stop it. What unfolds between these two is a simmering dual in the desert between two ferociously conflicting views. Is it better to look at suffering? Or is better to look away? Is it our moral obligation to try to stop suffering? Or is it true that every time we try to make things better we only succeed in making them worse? In a world beset by violence and horror, what is worth living for? Last year I felt overwhelmed by the amount of horror and suffering in the world. The unspeakable beheadings of journalists James Foley and Steven Sotloff struck a deep raw nerve. I could only imagine the pain that their families and loved ones were going through, are still going through. How do you live in a world where if you google the name of your loved one, you’ll be confronted with the image replicated a million times, of your brother, lover, son kneeling in a desert with a knife at his throat, moments from death? How do you continue to live in a world that is so cruel, so violent, so barbaric, so wrong? Of course, this last question applies to us all: at last count 210,000 civilians have been killed in Syria. "We choose not to look. The suffering is their problem, not ours. This film is my response to that." And yet the world does nothing. We do nothing. We sip our lattes, we take pictures of sunsets, we tweet about the lives of celebrities: it’s life as usual. We choose not to look. The suffering is their problem, not ours. This film is my response to that. It’s also a response to the experience I had making my first two films. The experience of making my first one was creatively very pure. The experience making my second film was more challenging. I felt like I made a thousand compromises, and although I’m proud of the final work, the process which gave birth to it is one I’d never choose to repeat. With both films, the shooting schedules were so tight that often I felt we were just making our days rather than making a film. So I started to conceive of a different way to make my third film, OF DUST AND BONES, a way that will give me real creative freedom as well as time to work with my actors on set in a different way, time to go deep, to shoot when the light is right, to explore the scenes in the moment of filming in a penetrating, profound way. To truly make the best film that we are capable of. I’ve had a huge paradigm shift in my approach to filmmaking since making my second film. With Chris Byrne, we launched the Rebel Heart Film Workshop, where we share step by step how to make a stand out indie film. We are making OF DUST AND BONES 100% according to the principles that we teach. Or please check out our website, Rebel Heart Film where I will also be blogging about the making of the film. Gaynor, who resides in London, played the lead in OBSELIDIA, for which she received unanimous critical praise. Other roles have included ongoing parts in the UK TV series Waterloo Road and Bad Girls, as well as parts in numerous theatrical productions. Michael, an Australian actor, played the lead in OBSELIDIA. He starred in the Aussie soap, Home and Away, and has appeared in films as diverse as Gabriel, Perfection and Prescient, as well as numerous theatrical productions. TV credits include 90210 and Mcleod’s Daughters. He recently starred in the critically acclaimed short, AFTER WE REST, and has an upcoming project, written and directed by musician/producer, Danger Mouse. His voice work includes, The Neighbors (ABC), Call of Duty and a short commissioned by O’Neill, directed by Andreas Roth. As well as being a gifted actor who recently starred opposite Christopher Walken and David Spade (in JOE DIRT), David is an award winning photographer. Born in the midwest, he studied theatre at Indiana University. He is currently prepping his debut feature as writer/director, THE MONARCH OF CRYSTAL FALLS which will star Allison Janney. Diane's second feature as writer/director, BLEEDING HEART, a feminist thriller starring Jessica Biel and Zosia Mamet premiered at the Tribeca Film Festival, April 2015. Her first feature, OBSELIDIA, premiered in the US Dramatic Competition at the Sundance Film Festival 2010, where it won the Alfred P. Sloan Award and the award for Excellence in Cinematography. It was nominated for two Independent Spirit Awards 2011, including one for Best First Screenplay. It won acclaim at festivals around the world, including being named as Best of Fest at the Edinburgh Film Festival, Best Narrative Feature at Ashland Indpendent Film Festival, and winning the Youth Jury Prize for Best Film at the Valladolid Festival, Spain. Her screenplay, STEM, was selected for the Sundance Screenwriter's Lab in January 2011, where it was awarded the Sloan Fellowship. She was selected for the inaugural Women in Film/Sundance Mentorship program in 2012. With her husband and producing partner, Chris Byrne, she recently launched the Rebel Heart Film Workshop, teaching 2 day intensives on how to make a stand out indie film. She is passionate about sharing her experiences making films to empower other filmmakers and strengthen our indie film community. After producing OBSELIDIA, Matt has gone from one production to another working as a Line Producer, Unit Production Manager and Producer on movies as diverse as CALIFORNIA SOLO, THE SPECTACULAR NOW (dir. James Ponsoldt), SUNLIGHT JR. (dir. Laurie Collyer) THE D TRAIN, and many more. Most recently he worked as UPM on the Netflix series WET HOT AMERICAN SUMMER. OF DUST AND BONES will be his second collaboration with Diane Bell Byrne. Chris has clocked up decades of filmmaking experience as an actor (credits include Titanic and Mad City), a stunt man, a military tech advisor (to John McTiernan, the director of Die Hard and Predator) and a Camera Assistant, learning all the nuts and bolts of physical production on literally dozens of sets. He produced the Sundance award winning feature, OBSELIDIA, and was subsequently selected for the Film Independent Producer's Lab 2011 and as a participant in the Sundance Institute Producer's Summit 2012. He has directed commercials, and produced and directed an acclaimed short film, THE TABLE, which played at festivals around the world. In 2014, together with Diane Bell, he launched the Rebel Heart Film Workshop, teaching step by step how to make a stand out indie film. With extensive production experience in music, fashion, and photography, Alexa's interest in film production began when she became the subject of a documentary about she and her twin brothers' journey back to the Ukraine in search of their birth family. In 2014, she produced The Warren, a short film shot on location in the West Bank, about the tumultuous nature and longstanding conflict between the people of Israel, and the Palestinian territories. Now, she is thrilled to be working alongside the rest of the OF DUST AND BONES team. She is currently attending USC School of Cinematic Arts. Bonnie currently works in Sony Pictures Entertainment's Strategic Sourcing group. She is a graduate of Harvard University with a degree in Government and Computer Science, with a background in business analytics and management, having worked at McKinsey & Company, and will be heading back east to Harvard Business School in fall. She has previously volunteered with the International Documentary Association and Tribeca Film Festival. Bonnie has recently joined the OF DUST AND BONES team and is excited to break barriers in film distribution with the rest of the Rebel Heart Family. TJ Hellmuth is a cinematographer based in Los Angeles working in feature films, short comedy, documentary, and commercials. TJ first started his professional career in New York City, working his way up in several departments as a 1st AC, key grip, and gaffer. 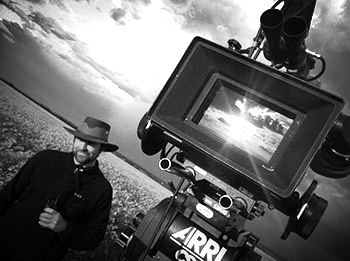 He recently was the DP for Corbin Bernson’s 25 Hill and The Human War. Besides from John-Michael's two collaborations with Diane Bell on Obselidia and Bleeding Heart, he has worked as editor on The Brass Teapot, starring Michael Angarano and Juno Temple (TlFF 2012 Official Selection), purchased by Magnolia Pictures, and All the Wilderness (Official Selection SXSW 2014), starring Kodi Smit-McPhee, Danny DeVito and Virginia Madsen. Some of his documentary credits include In Organic We Trust, distributed by Warner Brothers and No Cameras Allowed starring Mumford & Sons, distributed by MTV. As a writer, John-Michael wrote the feature length southern thriller The Killing Kind, which garnered him literary representation. This led to him being approached by Starthrower Entertainment (Jamesy Boy) about writing the feature length thriller Through Darkness, a thriller chronicling a high profile kidnapping case in a small rural American town. Julia was the production designer on Diane Bell Byrne's second film, Bleeding Heart, and they immediately struck up a deep creative rapport. Julia has worked in films for years, both in the costume department, clocking up credits on THE NOTORIOUS BETTIE PAGE, EMPIRE FALLS, and RUSH HOUR 2, credits as costume designer on TABLOID (the TV series), THE STEAM ROOM and HEIST as well as many more and lately as production designer on LOADED, PLAYDATE, and MEMPHIS RISING. COPYRIGHT © 2015 OF DUST AND BONES, LLC. ALL RIGHTS RESERVED.